8 Courts – each in 50′ bays. More space than any other facility in the Midwest! Full Floating Sport Court floor. Built on Neo-Shok performance pads, this floor has a high degree of rebound and cushion. Players will see reduced injury from repetitive jumping and training on this floor. A 5000 sq ft Strength and Conditioning room. 30′ wide Mezzanine, the most viewing area of any facility in the Midwest. Large concession area with dual serving windows for faster service. Largest Volleyball Retail store in the Midwest. Easy access, Located at the intersection of County 42 & Judicial Road. 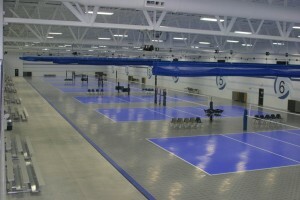 Midwest Volleyball Warehouse is designed specifically for Junior Olympic Volleyball and is a smoke and alcohol free facility. The facility is located in Burnsville 1.3 miles west of Burnsville Center at the intersection of County Rd 42 and Judicial Road. All cars must be parked in the parking lot around the building. The City of Burnsville will be posting “No Parking” signs on the street and they will ticket/tow cars parked on the street. It is illegal to drive over a curb and park on the Right of Way. The police will ticket all cars that do this. To avoid obstructing fire lanes and being towed, view our Parking Map. There is no parallel parking anywhere on the property. All parking is “head in” parking. Click here for our Parking Guidelines & Tow Information. 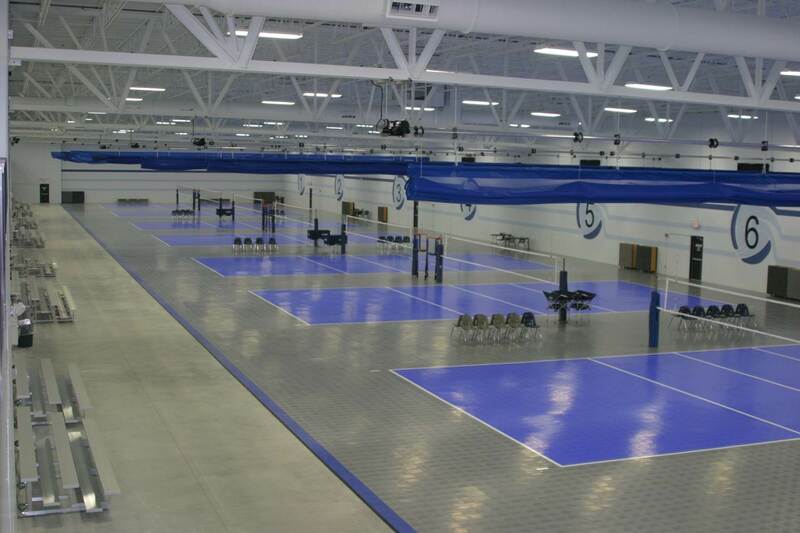 We are pleased to be playing in one of the finest 8 court volleyball facilities in the USA. To keep this facility in top condition and have a safe operating environment we need everyone’s cooperation in abiding by following policies and general rules. Staff will be at the door to enforce these rules. Individuals entering the facility do so at their own risk. The property owners, building tenants, event operators, and staff of Midwest Volleyball Warehouse and Northern Lights Junior Volleyball assume no liability for any injuries or accidents which may occur. No smoking is allowed in the building or within 15 feet of the building. The elevator usage is restricted to handicapped and elderly people only. Players and unaccompanied children are not permitted in the elevator. No portable / folding chairs may be brought into the building. You may bring in a seat cushion for sitting on the bleachers. No pets are allowed in the facility. Possession and/or the use of any type of weapon is strictly prohibited. Any action resulting in the activation of a fire alarm under false pretenses or any action resulting in the need to call the elevator service company to free someone from the elevator shall result in a $1000 fine against the individual/team/club whose member(s) or associated spectators who are responsible. Midwest Volleyball Warehouse and Northern Lights Junior Volleyball reserve the right to refuse play, admittance and/or service to anyone. Violation of any rules will result in ejection from the facility and loss of privileges. Conduct in the facility should be in the spirit of good sportsmanship both in the stands and on the courts. Children must be under direct adult supervision at all times. Children are not permitted to wander around the building without an adult with them. Children are not permitted to use open courts. Concessions are available for most events held at the Midwest Volleyball Warehouse. As such, no outside food or drink (other than water or sports drinks in non-breakable containers) are permitted in the facility during these events. No coolers may be left on the sidewalks or under the front entryway. All food and drink must be consumed on the mezzanine. No food/drink in the bleachers. Gum is not permitted in the facility. Absolutely NO ALCOHOL is allowed anywhere in Midwest Volleyball Warehouse or on its property. Players or spectators with alcohol in their possession or judged by the staff to be under the influence of alcohol or any illegal substance will be asked to leave/removed immediately. Midwest Volleyball Warehouse and Northern Lights Junior Volleyball have a ZERO TOLERANCE policy concerning the possession or consumption of alcoholic beverages on the property. If anyone is caught with alcoholic beverages, the entire team which is associated with that person will be immediately removed from the event and banned for 1 year in participation in any Midwest Volleyball Warehouse or Northern Lights Junior Volleyball events, no matter where they may be. If the person who violates this rule is a player, they will be permanently banned from participation in any Midwest Volleyball Warehouse or Northern Lights Junior Volleyball events. This is a ZERO TOLERANCE policy. There is no second chance, there is no appeal. Thank you for helping us keep our facility alcohol free and safer for everyone. No balls may be used on the mezzanine level. No volleyballs or ball carts may be brought into the building or taken out. Each court will have balls and ball carts on them. Footwear for all players must be non marking rubber soled sport shoes.